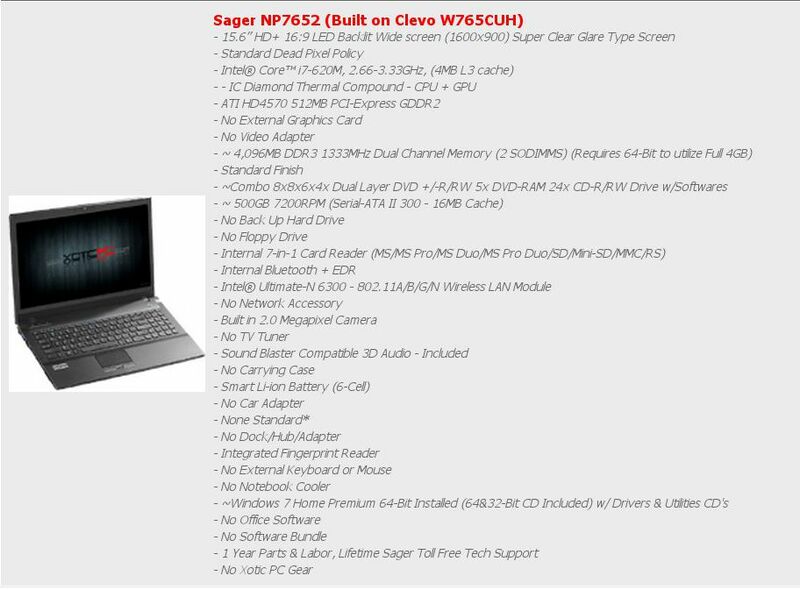 More info about this laptop on Xoticpc and Notebook Review. TuxMobil - Linux compatibility guides for laptops, notebooks, PDAs, mobile phones and GPS devices. Enable CONFIG_ACPI_CUSTOM_DSDT: make menu_config -> Power management and ACPI options -> ACPI (Advanced Configuration and Power Interface) Support -> Custom DSDT Table file to include. Select the downloaded file. Here is the diff of the original DSDT. The fans run at full speed since kernel boots up, but if you press the third hot key button (the one with a M surrounded by an elipse) the fans run quietly, this is called "silent mode". If you press it again the fans run at full speed again. OBS: the processor will *not* run at full power when in silent mode. OBS2: when using ATI proprietary drivers (ati-drivers ebuild) instead of the opensource drivers (xf86-video-ati ebuild) the fans run quietly. I tried to use phc-intel to undervolt the CPU C-states but it did not work as expected. It seems this Core i7 620m CPU recognise the undervolt and automatically reduces CPU performance instead of allowing it to crash. Do not worry, the crash is part of the tweaking process to get the voltage values to configure the phc-intel module. I tried all values from 20 mW to 1 mV at 2667 MHz clock and the CPU did not crash but the performance decreased when compiling the kernel. Since this CPU has turbo mode capability I guess it is it that is automatically decreasing CPU performance to avoid the crash. The clock stayed at 2667 MHz, but compiling the kernel was much more slower using 1 mV than with 20 mW. Apply the patch against the kernel. Enable it make menu_config -> Power management and ACPI options ->Enhanced Hibernation (TuxOnIce) -> File Allocator, Swap Allocator (if you have a swap partition), Userspace User Interface support and install the new kernel. Edit /etc/pm/config.d/gentoo and change the line with SLEEP_MODULE to SLEEP_MODULE="tuxonice". Now KDE's powerdevil plasmoid will use TuxOnIce to hibernate. Cambridge Silicon Radio bluetooth controller, driver: btusb.ko. JMicron SD/MS Host controllers, Secure Digital driver: sdhci-pci.ko, Memory Stick driver: jmb38x_ms.ko. Tested with SD and MS PRO Duo cards. Not tested but should work as well: MS, MS PRO, MS Duo, Mini-SD, MMC and RS cards. Works as expected, at least when burning an iso image to a DVD-r media (8x speed). Toggle Silient Mode (for power saving). When enabled, Silent Mode will reduce fan noise and save power consumption. Note this may reduce computer performance. I have configured udev to make show a KDE notification when the wifi, bluetooth or webcam is activated / desactivated. You can do the same for the silent hot key button using khotkey section in KDE's systemsettings, no need to go for udev. You configure hald and udisks to thread "e-sata" disks as removable. Udisks is the default disk manager in KDE SC 4.6.x, so it is preferable. Intel Ibex Peak HDA sound card, driver: snd-hda-intel.ko. Playback and internal microphone tested with Skype, all working. I moved my old /etc/asound.conf to /etc/asound.ferrari, it is not needed anymore because this sound card multiplex audio streamings without dmix alsa plugin. I do not have any s/pdif receiver so I cannot test it. Just a side note: when the power save mode is enabled (echo 1 > /sys/module/snd_hda_intel/parameters/power_save) every time you change the volumes with a mixer or some program starts to play something there is a short crack sound in the speakers. It sounds even when all volume channels are mute or using earphone. That is annoying, so I prefer to disable the power save mode (echo 0 > /sys/module/snd_hda_intel/parameters/power_save). Intel Ibex Peak EHCI controller, drivers: ehci-hcd.ko and uhci-hcd.ko. ATI HD4570 video card, driver: xf86-video-ati-6.13.0, firmware: radeon-ucode-20100408. Working with KMS+DRI2, Googleearth and Kwin's composite effects work together too!!!. To use the firmware enable make menuconfig -> Device Drivers -> Generic Driver Options -> Include in-kernel firmware blobs in kernel binary. Then type "radeon/R700_rlc.bin" in "External firmware blobs to build into the kernel binary", copy /lib/firmware/radeon/R700_rlc.bin to /usr/src/linux/firmware/radeon/ and compile the kernel. Using ati-drivers ebuild brings one big advantage: the GPU runs cooler and the fans run quieter (as quiet as in Windows 7). I think it also helps with battery time, but I have not measure it. That only works as long as Xorg is running, if you to go the console (Ctrl+Alt+F1) the GPU fans start to run at full speed. Going back to Xorg makes them run quiter again. The 3D performance is noticeably better with ati-drivers. One disadvantage in using ati-drivers is that you have to disable KMS (kernel modsetting) and the radeon kernel module. Otherwise the LCD gets blank when Xorg starts and you will have to restart the notebook to restore the video card to the correct state. Using composite (3D effects) while playing movies usually makes the movie flicker. To solve that problem DRI2 and KMS were created but since we cannot use KMS with ati-drivers I thought I would have to disable the 3D effects when using mplayer. Fortunately there is no flicker :-). In my old notebook (Ferrari 4005, ATI x700 card) the flickering is very annoying. I still own the Ferrari 4005, anyone here wants to buy a Ferrari notebook? :-) The battery still holds 72% of the original manufacturer capacity (around 3400 mAh) and everything works in Linux, accept the svideo port and the card reader, which does not read SD cards anymore, but reads Memory Stick (weird, hugh?) It comes with a bluetooth mouse too. GPU load always stays at 0% and the thermal sensors are not compatible with aticonfig. Everest in Windows 7 is able to get the GPU temperature. As you can also notice the GPU and Memory clocks cannot be changed. Work as expected (both video and audio). You need to configure /etc/asound.conf to route audio to the sound card that the video card (ati 4570) registers or use pulseaudio. Intel WiFi Link 6000, driver: iwlagn.ko, firmware: iwl6000-ucode-9.193.4.1. CFLAGS="-O2 -march=core2 -pipe -fomit-frame-pointer -msse3 -msse4 -mcx16 -mpopcnt -msahf"
Symbolic link: /etc/make.profile -> ../usr/portage/profiles/default/linux/amd64/10.0/desktop/kde . It is ironic the fact that Gentoo use amd64 profile for an Intel processor. Thanks for this wonderful post.Admiring the time and effort you put into your blog and detailed information you offer. Thanks for the helpful post! I would not have gotten this otherwise!. Great piece of writing! I am agree with the author's opinion. The removal of details often takes a user to a a feeling of disappointment.